Using Office on a touch screen will get a whole lot easier soon. Microsoft has unveiled a new version of Office that gives each of its apps a mode built around use on a touchscreen — a feature that their predecessors quite noticeably lacked. The new version, which Microsoft calls "a preview of a work in progress," looks quite a bit like the Office that was unveiled for the iPad just last week: apps have a simple bar on top, leaving most of the screen below for viewing documents. Most importantly, the toolbars are sparsely populated and feature buttons that should be large enough and spaced far enough apart that they'll be easy to select with your fingers. That said, the version Microsoft is showing on stage looks more full-featured than the stripped-back iPad app. Microsoft's famous "Ribbon" UI is still around, but it's been nipped and tucked to make sense in a touch environment. Just like the iPad app, there are also pinch-and-zoom gestures, and pop-up contextual menus for modifying your documents. Though the touch-centric Windows 8 has been out since October 2012, Microsoft hasn't built a version of Office tailored to it until now. In the meantime, Office users have been stuck with the only modestly helpful Touch Mode, which made buttons slightly easier to touch by spacing them apart. 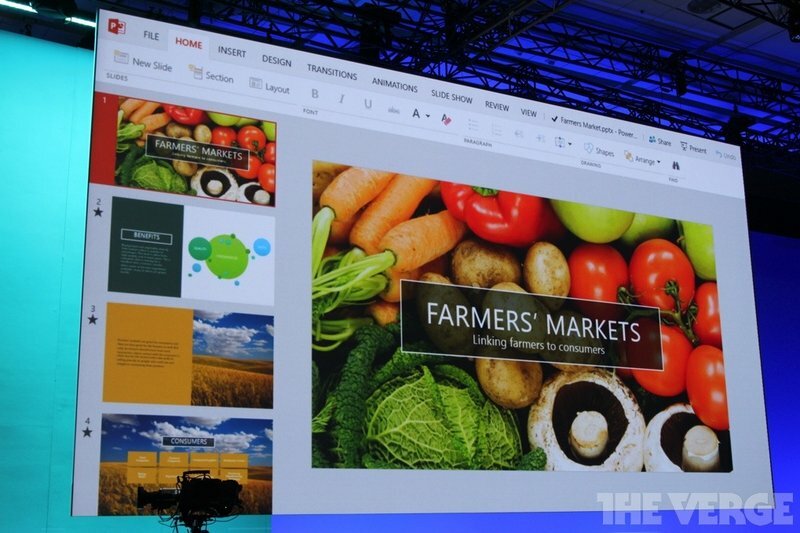 Today's Office news also ties into another big announcement f the day: universal Windows apps. Thanks to Microsoft's new developer feature, the new version of Office will be released across all the Windows family. That means the new office is not only coming to Windows laptops and tablets, but also to Windows Phones. The new Office will be a big — and long-awaited — addition to Windows 8, which has put off many longtime users with its new and sometimes incongruous design. Office has always been one of Microsoft's biggest stars, and with a version now properly built for touch, Microsoft may have an easier time convincing customers to make the switch. Unfortunately, Microsoft didn't give any clues as to when the new touch-friendly Office will be available. The software looks to be in quite an advanced stage already, so it's likely Microsoft will release it at some point this year. Aaron Souppouris contributed to this article.